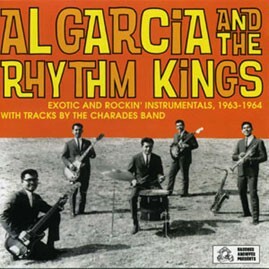 From Delano California, The Rhythm Kings were 'discovered' by the legendary Anthony Hilder. The group had singles on Challenge, Del-Fi, Tollie and GNP/Crecendo. Recorded mostly in 1963, most of these tracks have never before been released and were taken directly from first generation studio tapes. A great combination of exotica, instrumental rock 'n' roll and surf! As a bonus, we've included two tracks by The Charades Band (known for their Doo-Wop sound) from their sole rare instrumental 45 on Impact.